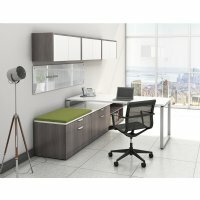 The Elements Plus Series provides stylish, modern desk types with durable laminate 3mil PVC Tough Edge on all Exposed Edge, Top Quality Ball Bearing Drawer Slides, Flared drawer pulls for an enhanced look, and core removable locks included. Contemporary, reliable, and durable, and available in 4 finishes, White, Modern Walnut, Espresso, and NEW Newport Gray. Desk is approx. 72 " x 30" . Includes 2 36x22x21 Two-Drawer Personal Cabinets and one Bookshelf of identical proportions. 2 Matching cabinets plus 1 matching bookshelf 36 by 22 by 21 inches. 30x8h loop riser for desk. A single cushion in 1 of 5 finishes for cabinets.